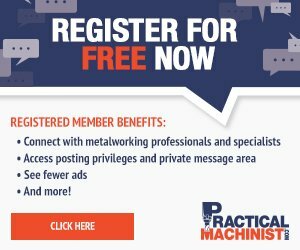 Practical Machinist eZine Modern Machine Shop "We Belong Here"
This is such an important change that it is worth noting for its own sake. Greater inclusiveness in manufacturing is good for our industry, and it is playing out in very real ways in businesses across the United States. By examining the experiences of those who are living out that inclusiveness, we gain valuable insight into what their experiences may teach us. With that aim in mind, I am writing a story about three women whose manufacturing careers span various ages and stages. Notably, this story appears in a magazine that just this year included its first cover story written by a female staff writer. (See our July issue.) Don’t get me wrong, this certainly wasn’t the first feature-length story penned by a woman to ever run in our magazine; we’ve been doing that for years. That story, however, just happened to have the right photography, intrigue and “cool factor” that made it the best cover candidate compared to our other stories that month. It was a darn-good story that proved to be the best fit for the job. While there was an element of happenstance to this situation (we didn’t push to have a female author specifically write that cover story), the outcome wasn’t reliant solely on chance. In recent years, Gardner Business Media, publisher of Modern Machine Shop, has been hiring more and more women for writing positions as many of its established writers near retirement age and create a skills gap that mirrors that of our manufacturing industry. Historically, both our publication and the industry we write about have looked to men to fill this void, but that fact is gradually changing to the benefit of the companies embracing it. As you read the stories of these three successful women and their manufacturing careers, really pay attention to what they are saying. Women want STEM educations. Women want to work with their hands to create things. Women want to become leaders and mentors on the manufacturing shop floor. Women want manufacturing careers. If nothing else, these women’s stories should make clear that the manufacturing labor pool might be larger than many of us realize. Dana Kensmoe’s welding career can be traced back to a school program that helped her realize a passion for the job. We first talked to Ms. Kensmoe back in 2012 when she was a junior at Eleva-Strum High School in Strum, Wisconsin. Her first manufacturing job was at Cardinal Manufacturing, the high school’s vocational program that runs as a commercial business, taking on contract manufacturing work from commercial customers under the direction of teacher Craig Cegielski. “I first started welding as an eighth-grader after taking some exploratory classes in Mr. Cegielski’s vocational program. I thought it was so cool, and it seemed like a lot of fun. I loved watching raw material become something. 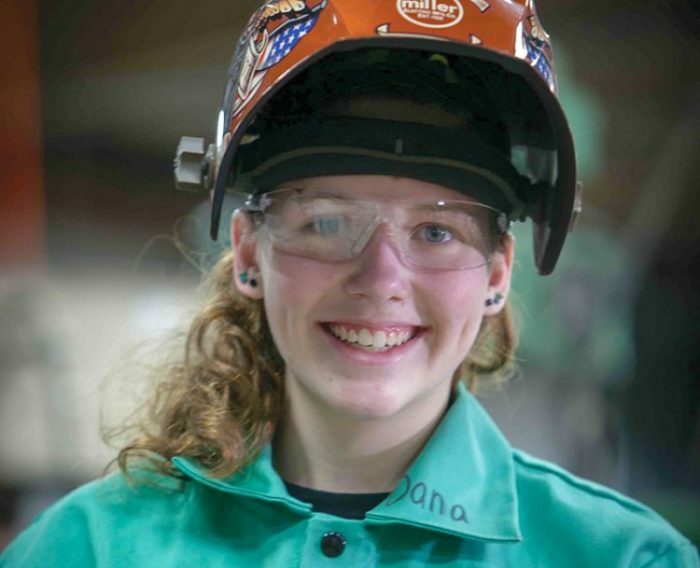 I felt welding is something I could never get sick of,” Ms. Kensmoe says. Dana Kensmoe’s welding career began in the eighth grade under the mentorship of teacher Craig Cegielski and the Eleva-Strum High School’s vocational program, Cardinal Manufacturing. The photo above was taken in 2012, when we first wrote about the program. Read the full story at gbm.media/hs-shop. Photo: Todd Schuett, Creative Technology Corp.
Today, she works as a welder at Global Finishing Solutions, a manufacturer of paint booths and finishing environments in Osseo, Wisconsin. From the beginning, Ms. Kensmoe knew that she wanted to work at Global. Three things attracted her to the job: location, type of work and company culture. When she first started at the company, it was only 12 minutes from where she lived. Now, she gladly drives 45 minutes each way because “the benefits and the people are great.” The main benefit is that she finds her job truly interesting. “It’s not piecework like at other companies—I have no interest in that,” she says. At Global, she sometimes makes 20 to 50 pieces of the same product, but sometimes she makes manifolds, which is her favorite job because they have to be air-tight. She says they put her pipe-welding skills to the test. Landing her dream job, however, was not entirely an easy task. Even though she applied several times at Global after she graduated from high school, the company’s foreman kept telling her the same thing: “Too many people don’t follow through with their education. Call me when you finish your technical training.” So that’s what she did. After working hard to finish her one-year welding program at Chippewa Valley Technical College (CVTC), she chose to go the extra mile and continue her studies by completing the school’s two-year welding fabrication program, which is designed to extend skills and widen job opportunities. With three years of post-graduate training on top of the foundation that was laid at Cardinal, Global recognized the value, knowledge and skillset she could bring to its workforce. She was finally able to secure her position there in 2016. At the time of this writing, Ms. Kensmoe was pregnant and temporarily working in a different department due to fume and weight restrictions. 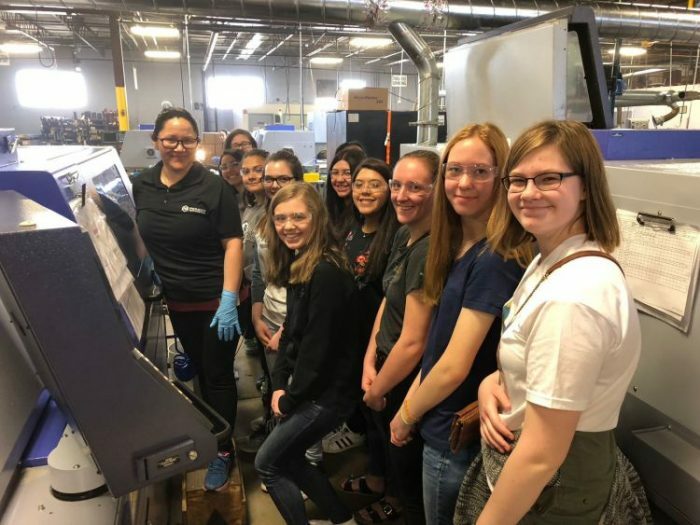 She did, however, revisit Cardinal Manufacturing to shoot a quick welding demonstration for this article and reconnect with the teacher and program that helped guide her career choice. Photo: Dana Kensmoe. 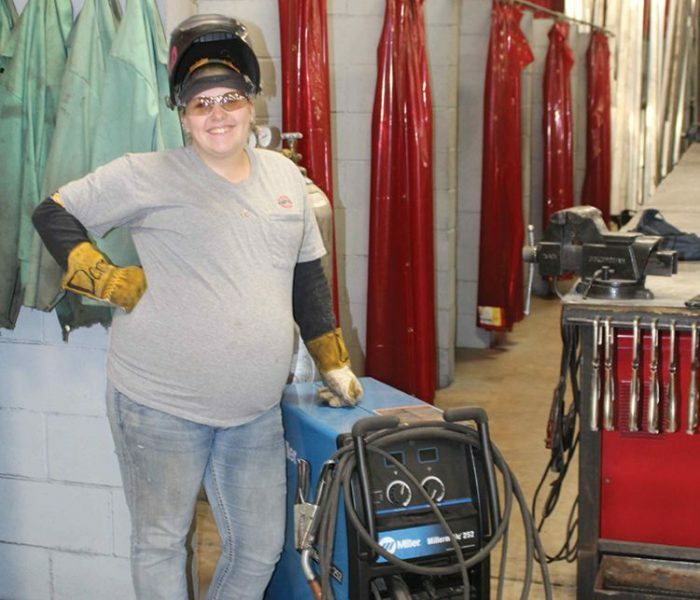 While working hard and proving that she is actually a good welder “for being a girl” is what earned her the job, Ms. Kensmoe says it is her attitude and personality that has helped her fit in on the shop floor. “You can’t get offended easily by anything that is said or done. You have to be ‘one of the guys.’” That being the case, she says she doesn’t encounter as much resistance to her being on the shop floor by her own generation as she has encountered from the previous ones—a sign that things are slowly changing. Ms. Kensmoe feels at home welding at Global, so much so that she wasn’t nervous about announcing her recent pregnancy at work. She says everyone was very excited for her and helped make accommodations when she was put on a 20-pound weight restriction. At the time of this writing, she was temporarily transferred to light-cell duty, where she puts wires in the lights that go in Global’s paint booths. While some people are hired specifically for this job, she says others are moved to this more physically accommodating position when they have surgery or get hurt. Global always finds a place for its employees, she notes. After her 10-week maternity leave, Ms. Kensmoe plans to return to her welding job, the role in which she feels most at home. More than that, she wants to return to welding because that is the work that she was hired to do. “I don’t work a day in my life because I love welding so much,” she says. Not all manufacturing careers begin when a person earns her diploma. Some opportunities begin out of necessity. When applying for a job in the United States, and English is not your first language, you find a job that lets your actions speak to your strengths. That was the case for Elena Rodriguez, who began her manufacturing career in 2006 working with plastics machines and printing labels on plastic parts. In 2010, Ms. Rodriguez decided to expand her career as a CNC lathe machine operator, and within a couple months she transitioned into the role of CNC lathe setup person—a job that normally takes years of training to attain. Another opportunity was then presented a year later in the Swiss-type-lathe department where she honed her skills and became a premiere setup person. After a short layoff period, a former coworker mentioned her capabilities to Aneesa Muthana, owner of Pioneer Service in Addison, Illinois, where she has been employed since 2017. Attaining a job in a non-native-language position and quickly moving to a new role represent two cases in which Ms. Rodriguez has broken through barriers. A third has been thriving as a machinist/setup person on the male-dominated shop floor. Her ability to do this comes from the confidence that was instilled in her from the beginning, she says. As a child, her father used to show her his builder’s blueprints and teach her how to read them. This ignited her passion for making things. In addition, she says her mother was a strong woman who instilled in her a work ethic to do a good job and fostered her desire to work with her hands. Her parents taught her to achieve her dreams through hard work and dedication—lessons that have served her well on the shop floor. Her strength and willingness to prove herself helped her in her former job where she says her CNC supervisor expected her to fail. Instead of being intimidated, she did the physical work of lifting barstock and loading machines, along with the knowledge work of properly understanding tooling management and loading. Eventually, she proved to her supervisor that she was more than qualified for the job, and he then became her biggest advocate. Today, Ms. Rodriguez sometimes runs four to five Swiss-types, though the normal protocol there is three. When one job is completed, she is busy standing on her step stool, setting up another. In the midst of doing all that, she has taken it upon herself to encourage and train women (and men, too) who are new to the shop floor. If someone shows an interest in learning how to do something, she takes them under her wing. According to Ms. Muthana, her employer, this is not the industry norm. “Machinists tend to be very protective of their skills. Guarding them is a form of job security,” she says. Having an employee willing to help others has created a more positive work environment. Pioneer Service has also benefitted from Ms. Rodriguez cross-training and developing employees. As the owner of a precision machine shop that provides Swiss screw-machine products, CNC-turned parts and centerless-grinding services, Ms. Muthana has faced her share of challenges. Although she had a passion for learning how to run machines in her father’s shop, he encouraged her to work in the front office. Not one to back down, she made a compromise with her father to install speakers on the shop floor so she could run back to the office to answer phones when necessary. Over the years, Ms. Muthana grew in her ability to run machines and lead projects. By 1993, her uncle had taken notice and asked her to work with him at Pioneer Service. Mindful of being accepted as an unfamiliar woman in a shop full of men, she agreed to be part of Pioneer Service on two conditions. The first was that her uncle would be a silent partner. The second was that she would become President of Pioneer Service. Part of the way Ms. Muthana set out to run her business was to try to build an inclusive workforce. In fact, today, women comprise about 40 percent of her employees. Along with Ms. Rodriguez, four other women work on her shop floor in machine operator and quality assurance roles. Uphold that message in conversations as your team adjusts to the change. Ms. Muthana explains further: “For us, the mission is not to create silos and divide workers. Instead, that mission is to create a work environment where everybody is welcome regardless of gender, race or age. If people do not feel comfortable, they won’t contribute to manufacturing, and the industry will die,” she says. Business owners must open their eyes to the option that women are a good fit for all types of manufacturing jobs, she contends. “It’s harder now to retain newer employees and develop more veteran employees. If women aren’t an option, then that’s a problem for the company, not the woman. The Manufacturing Institute’s STEP Ahead initiative is designed to promote the importance of women in science, technology, engineering and production (STEP) careers. The Step Ahead Awards recognize women in manufacturing who demonstrate excellence and leadership in their companies and communities.